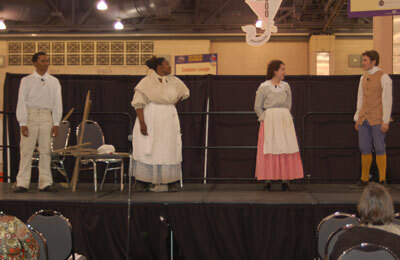 The Accokeek Foundation performs "Ties that Bind"
at the 2009 Museum Theatre Showcase. It really felt like IMTAL (and museum theatre!) was everywhere at the 2009 AAM Annual Meeting in Philadelphia, PA! A huge thank you to AAM and to EdCom for making this year one of IMTAL's most successful AAM conferences yet! The IMTAL Board meeting included two of our new board members: Marcos Stafne as Publications Officer and Hyla Crane as Treasurer. Other board members transitioned into new positions, including Simone Mortan to President, Jillian Finkle to Vice President, and George Buss to Past President. Former Treasurer Greg Hardison and former President Paul Taylor joined in to review the current strategic plan and prepare for the upcoming Monterey conference. We were unable to conference in our new Secretary Stephanie Long (because internet access at those hotels is so expensive!) And while Membership Officer Elizabeth Pickard was in Hawaii, she did send us a photo of her with a Mai Tai along with her membership report. Wilton Corkern, President of the Accokeek Foundation in Accokeek, MD, received the 2009 IMTY award for outstanding support of museum theatre. After a tasty lunch, participants were treated to a mini-workshop with Jillian Finkle on creating accessible theatre through the use of pantomime and different techniques to integrate sign language into performance. Thank you to EdCom for inviting us to participate once again in the Marketplace of Ideas. IMTAL hosted a booth where we promoted museum theatre as an educational and interpretive technique in museums and spread the word about IMTAL. We made some new friends and raffled off a free membership. A special thank you to member Laura Ayers for volunteering to work at the booth! IMTAL member Paul Taylor of the Franklin Institute organized an informative session titled "From Pee-Wee to Piaget: Creating Developmentally-Appropriate Museum Theatre." He provided specific suggestions for performances geared toward different age groups: ages 3-5, 6-7, 8-10, and 11-13. His handout is available on the AAM website. Paul and his panel (George Buss, Greg Hardison and Lynda Kennedy) performed and demonstrated (often with the help of the attendees!) examples of appropriate programs for each age group. The Museum Theatre Showcase was probably the most ambitious Showcase IMTAL has ever presented, with seven different institutions represented. The stage was centrally located the center of the Expo Hall with very clear signage and a great sound system. In addition to presenting the popular public speaking workshops on three mornings this year (thank you to George Buss, Greg Hardison, and Lynda Kennedy), IMTAL hosted a workshop titled “Improving Leadership Through Improvisation: Theater Skills for the Museum Professional” which was led by members of Philadelphia’s Comedy Sportz. These events broadened IMTAL’s reach and visibility while providing a valuable service to the museum field. IMTAL is now accepting suggestions and volunteer panelists for proposals for the 2010 AAM Annual Meeting which will be held in Los Angeles May 23-27, 2010. The theme is "Museums Without Borders." Anyone wishing to submit a proposal as part of IMTAL please contact Vice President Jillian Finkle.